Welcome to "The Original Mobile Discotheque", specialists in providing top class entertainment for your party or function. Gone are the days when a DJ turned up with a couple of speakers, a light box and a box of records, played his choice of tunes all night and then left. These days its all about intelligent lighting, star cloths, radio microphones and crystal clear sound systems matched to your venues acoustics. If you want to know more about the equipment that we use then please take a look at our roadshow details here. DJ's come in all sorts of varieties, there are those who will play an amazing set of mixed dance tunes and have a minimal mic policy right through to the personality DJ who will be vocal on the mic and play party tracks. 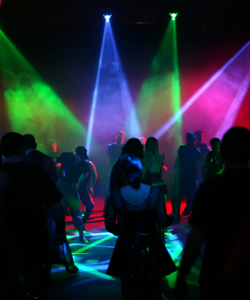 It is therefore very important to decide and communicate what sort of party you require. We are immensly proud of all our DJ's and as such always encourage feedback on how you thought your event went. You can find out more about our team of DJ's here. Most importantly of all though is to remember that your DJ is a professional, let him worry about the party and you concentrate on your guests and enjoying yourself. 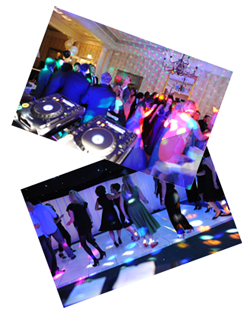 All our DJ's welcome requests on the night and the more interaction between them and your guests, the better your party will be. Please Contact Us to discuss how we can help with your event and any services that you may wish to have provided as well as a disco.